At his blog The Hitchcock Papers, Web denizen John Greco has amassed a small fortune of photo stills, lobby cards and newspaper ads dealing with Alfred Hitchcock and his films. The site is well worth your attention, and I'm sure I'll be stopping by periodically. As with all classic film, Hitch's movies are shown primarily at independent theaters and art houses, or are simply rented on DVD. It's easy to forget that they were originally part of the mass entertainment landscape. John's site does a great job of returning them to the media context in which they were released. 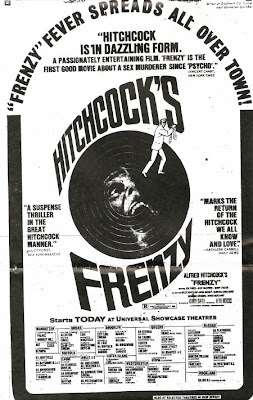 Good info on the context of Hitch's film release ads. Name recognition is still very high. Hitchcockian is in the Oxford English Dictionary. I have already added the link to my blogroll. Very interesting info(rmation) about the "Master of Suspense."